Optical Image Correlating Velocimeter (ICV) was developed to measure speed and length of product in metallurgical process. The ICV represents alternative solution to laser doppler based instruments achieving similar accuracy on good quality surfaces and superior accuracy on rough and poor quality surfaces. For detailed description of principle of operation refer to paper . The production model of the ICV is shown in Fig.1. The ICV has been installed on quad continuous caster machine, connected to MNLZ process control system, and operated flawlessly over 9 month period. 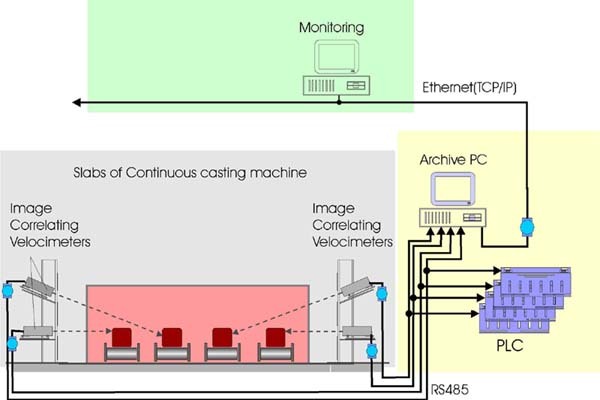 Figure 2 shows installation diagram and four ICVs monitoring quad caster machine. 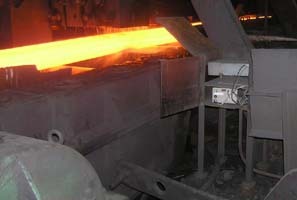 The point of installation was close to the slab cutting machine. Figure 3 shows photograph of two ICVs monitoring first and second slab on the quad caster. ICV at the bottom is pointed at the first slab, which is 1800mm away, while upper instrument monitors the second slab 3700 mm away. At this distance both ICVs operated without need for cooling. 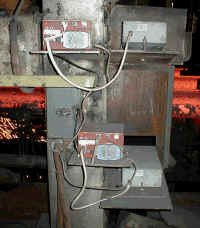 All four ICVs were connected to process control and monitor computer, which processed and recorded data. Data from the ICV can be also used to control operation of slab cutting machine. Important feature of ICV is instantaneous reading of slab velocity and possibility to detect fast and sudden changes in slab speed caused by instability in the crystallizer. Test results of pilot installation and operation of the ICV were published in papers and . Figure 5 show ICV installed 2100 mm from the billet surface and controlling cutting machine. For accurate operation measured object must fill ICV’s field of view, which at 2 m distance is 20 mm high and 250 mm wide. At 4 m distance field of view is 40 mm high and 500 mm wide. 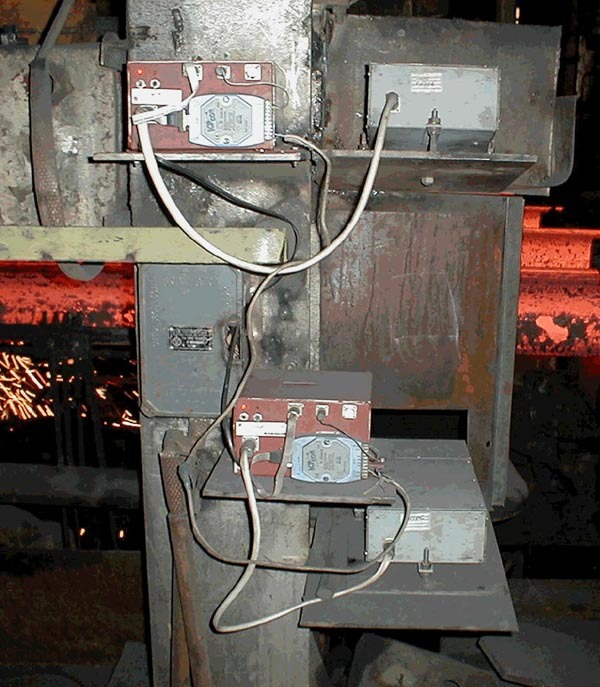 ICV operates properly over product temperature range of 1100°C to 450°C. Measuring to cooler products requires additional illumination. Two 100W bulbs placed at 2 m to 2.5 m distance from the product surface provide sufficient illumination. Иерусалимов И.П., Суковатин И.В. Исследование динамики продвижения слитка МНЛЗ при разливке // Сталь. - 2003. - №4. - С.26. Аникин А.В., Иерусалимов И.П., Суковатин И.В. Система контроля перемещения слитка// Современные технологии автоматизации. - 2004. - №1. - С.18-22. Аникин А.В., Иерусалимов И.П. Система контроля длины блюмов при порезке слитка// Сталь. - 2004. - №7. - С.47.